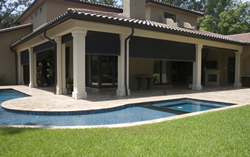 Townsend Construction is proud to represent Phantom Screens in Pensacola and Surrounding areas. 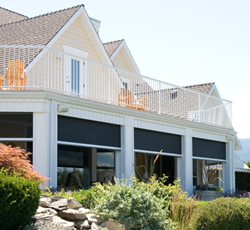 • Retractable screens cut heat and glare, offer insect control, natural ventilation, and energy savings…and then disappear to restore unobstructed views. • When ued properly, retractable screens offer a solution to a myriad of design challenges in designing energy efficient buildings and a greater connection with nature: they form part of a building's daylighting strategy to lower energy costs and increase occupant comfort while promoting natural ventilation, insect protection and enhanced privacy. • Motorized retractable screens that are connected to sun and wind sensors can be programmed to retract and lower the screens before solar heat gain occurs. The sensor also retracts the screens in excessive winds, which would otherwise be difficult to monitor. 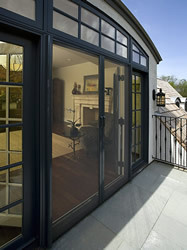 • Retractable screens offer solutions in several of the LEED-NC v3 categories. Credits are earned for reducing energy use — and with their ability to reduce daytime glare and the amount of air conditioning required to cool building interiors, retractable screens offer potential to contribute to LEED credits in several areas. Conventional insect screens compromise the integrity of a building's design, block views, diminish natural daylight, and make routine window cleaning difficult. 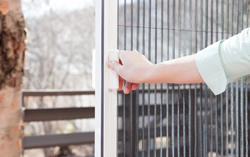 Phantom Screens offers retractable screen solutions for doors, windows, and oversized openings that overcome these limitations, in place when required, and retracting out of sight when not in use. What are the main benefits of Phantom Screens? Phantom Screens' screen solutions maintain the design of the building, provide privacy, insect protection, and better ventilation, plus manage solar light. These retractable screens can also reduce solar heat gain on the inside of the building and decrease energy costs for cooling the building. Phantom Screens provides after sales support — their experienced screen installers and Authorized Distributors are available for service calls and product questions even after the sale has been completed. 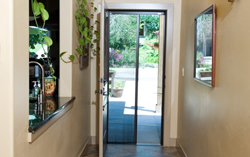 Phantom Screens provides screen solutions that are custom fit to all types of openings: Legacy and Professional Door Screens cover all door types including patio sliders, in-swing and outswing doors, double-French openings, as well as front doorways. Serene Window Screen is most typically used for insect or solar protection and added privacy on all types of windows including double-hung, casement, and tilt 'n turn applications. Motorized Executive Screen is designed for large openings including covered verandas, porches, and floor-to-ceiling picture windows. Manual Infinity Screen is ideal for screening folding wall systems and oversized openings such as patios and verandas without limitations to the span or width of the opening. Manual Distinction Screen is suitable for screening large openings and oversized doors in high traffic areas (in-swing and out-swing doors, single and double oversized doors, and other large openings). 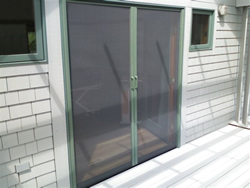 A retractable screen consists of four main components: Mesh — the material comes in a wide variety of colors, fabrics, and materials depending on whether insect or solar protection is required. Housing — the mesh is stored within extruded aluminum housing when retracted, along with the tube and spring or motor mechanism. Phantom uses a combination of low profile components; various finish options including custom coatings, and colormatched fasteners to blend the screens seamlessly into the building structure and décor scheme. Slide bar — the "handle" that brings out the screen when needed or helps it smoothly retract back into the housing when the screen is not in use. Depending on the application the screen may be held in place with a magnet or latch system when in use. Tracks — fastened to the top and bottom of the door frame (or the sides of the frame in the case of a window or Executive), the tracks keep the screen in place when in use. Phantom Screens retractable screen solutions can be installed both on the interior or exterior of buildings. In order to protect the screen components from weather and moisture, corrosion-resistant fasteners are used. The finishes are chip-resistant and covered by Phantom's Limited Lifetime Warranty.